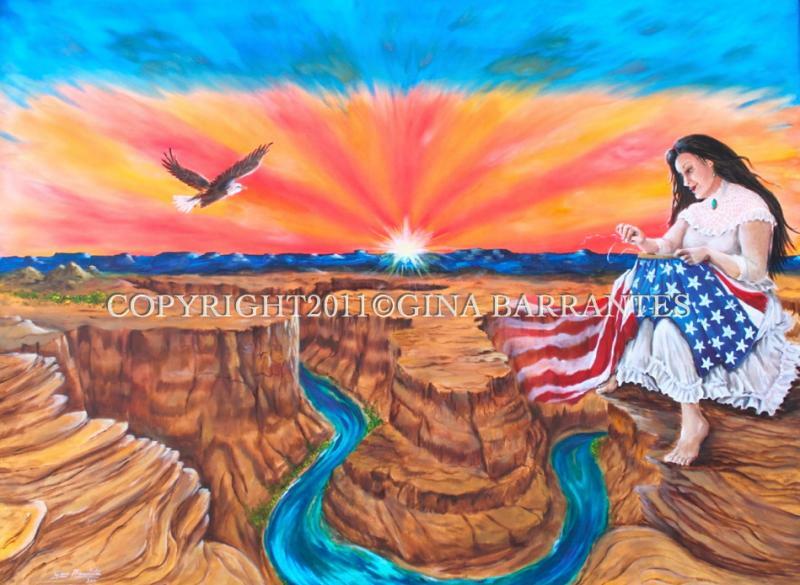 On February 14th﻿, 2012, Arizona will celebrate its 100th year of statehood﻿, and Gina has created three amazing pieces in honor of this historic event.
" 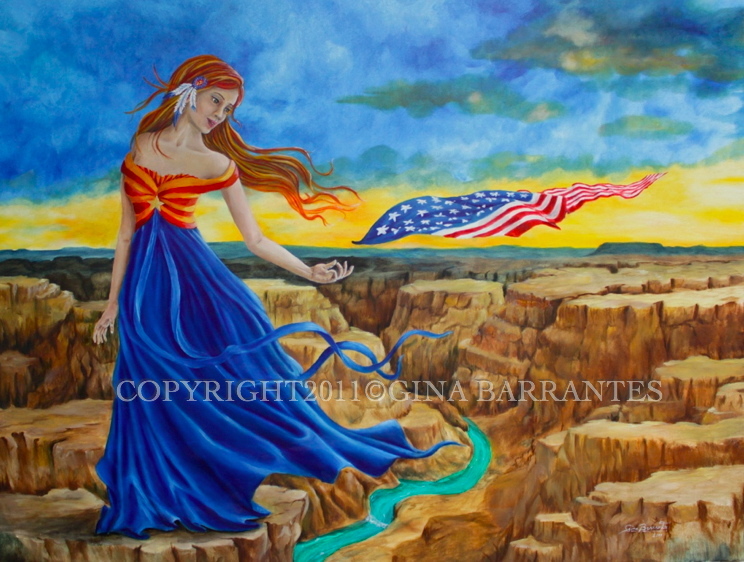 A NEW STAR FOR OLD GLORY"
This piece is a tribute to Arizona's 100th year anniversary on February 14, 2012. The art work is a romantic representation of the birth of a new star, star number 48 on our flag. In the background, in a surreal fashion, these wonderful colors of the Arizonan sunset form Arizona’s flag where the sun represents in a majestic explosion, the birth of a new star. Closer to the front, one of the most photographed sceneries in the Grand Canyon, the illustration of Horse Shoe Bend in Page Arizona is displayed. Here, the Colorado River leaves its print in an artistic manner in an inspiring scenery. To the right of the painting, seated on a rock, we find a woman of fair skin, light colored eyes and dark hair, clothed in an early 20th century dress that was commonly used in the southwest, wearing turquoise jewelry that is traditionally handcrafted by the Native Americans of the region, in all, a representation of the mixture of the cultures this state gathers. In her lap and in her hands, the flag of this sovereign Nation. Looking closely at the distribution of the stars and how they are placed in a parallel, horizontal and vertical manner. This is an illustration of the flag when it had 48 stars. The flag was modified on July 4th 1912 where the stars for the state of New Mexico (47) and Arizona (48) were added. The lady is embroidering on the inferior right corner of the flag, the last star, number 48, Arizona State. The 13 stripes that represent the first 13 colonies are moved with the wind and are blended in with the lines that have been left in time, in the walls of Grand Canyon. 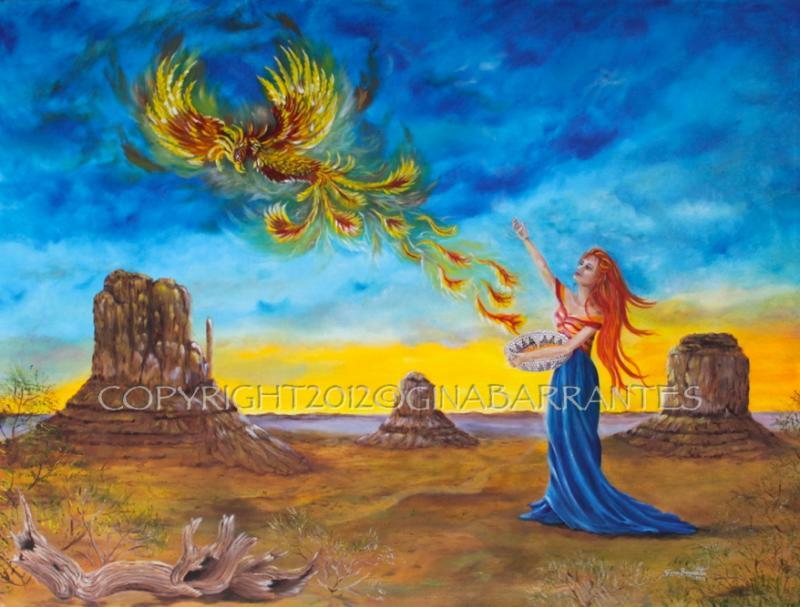 "The Birth of Phoenix" is a majestic art piece﻿ that holds a lot of symbolism﻿ . At the heart of Navajo Nation, Monumental Valley, Arizona Flag is holding in her hands a Ceremonial Navajo basket (Ts' aa') from which the Phoenix rebirth. One of the grandest – and most photographed – landmarks in the United States, Monument Valley Navajo Tribal Park is a sprawling, sandy preserve that spans the border between Arizona and Utah, bathing the region in rich red hues. Dominated by crimson mesas and surreal sandstone towers – some as tall as 1,000 feet – the area is also known for dramatic, mesmerizing lighting, with the sun illuminating the towers and casting long shadows on the valley floor. Located inside the Navajo Nation – one of the largest Natives American Tribes in the United States – Monument Valley is around four hours northeast of Flagstaff, near the Four Corners area. A phoenix is a mythical bird with a colorful plumage and a tail of gold and scarlet. It has a 500 to 1000 year life-cycle, near the end of which it builds itself a nest of twigs that then ignites; both nest and bird burn fiercely and are reduced to ashes, from which a new, young phoenix or phoenix egg arises, reborn anew to live again. The phoenix has long been presented as a symbol of rebirth, immortality, and renewal. In traditional Navajo thought, the ceremonial basket (Ts'aa') is a metaphoric representation of the individual life course. It also tells the collective history of the Navajo, and it symbolizes the Navajo homeland. In conjoining these three aspects of existence, it expresses the interconnection of individuals with their culture and natural environment. ﻿ Navajo ceremonial baskets are used in weddings, girls’ puberty rites, and traditional healing ceremonies. Made of sumac and coiled from left to right, they are usually from 12 to 14 inches in diameter. The rim of the ceremonial basket is finished with a diagonally plaited herringbone pattern. The overall design is always broken at one point, allowing a pathway from center to periphery, and the last coil of the basket ends at the point where the break occurs. In ceremonial practice, the gap in the basket’s design is always oriented to the east.